Fracking would completely transform the oil drilling industry, especially when combined with advanced horizontal drilling. Oil that was once thought to be financially “unrecoverable” suddenly became very accessible and could be extracted for far less money that even the most pie-in-the-sky optimists believed. Instead of soaring crude oil, prices collapsed as new, previously unaccounted for oil flooded the market. Sentiment is now reversed. Fracking, combined with ascendance of the electric car led by Elon Musk and Tesla, has some analysts predicting a new normal in crude oil in which markets chop sideways in a trading range as higher prices spur more production at the top end of the range and more production causes prices to fall to the point where production limits are imposed by big producers like OPEC and Russia at the bottom end of the range. That is precisely what has played out until recently. Friday’s settlement was the fourth consecutive close over the previous top of a long-established trading range in crude oil and the twelfth close over the key 38-week moving average. 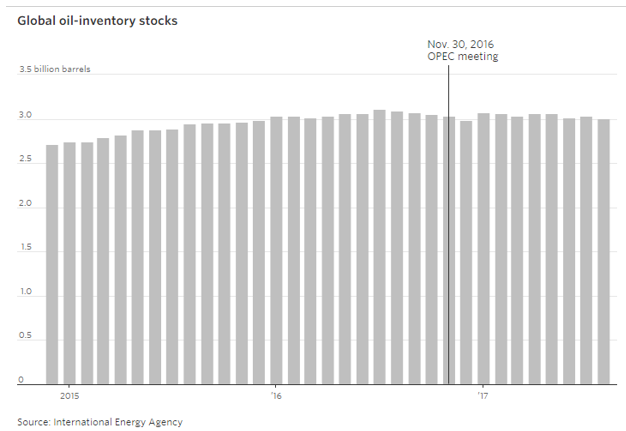 For the first time in two years, a rally to the top of crude’s trading range has not been met with selling but instead, with more buying. This is a big change in market behavior. Electric vehicles represent just a small fraction of the cars (and trucks) of the road. The vast majority of new vehicles sold worldwide are still powered by petroleum. Commercial aircraft will continue to be powered by petroleum for the foreseeable future as will most transportation alternatives. 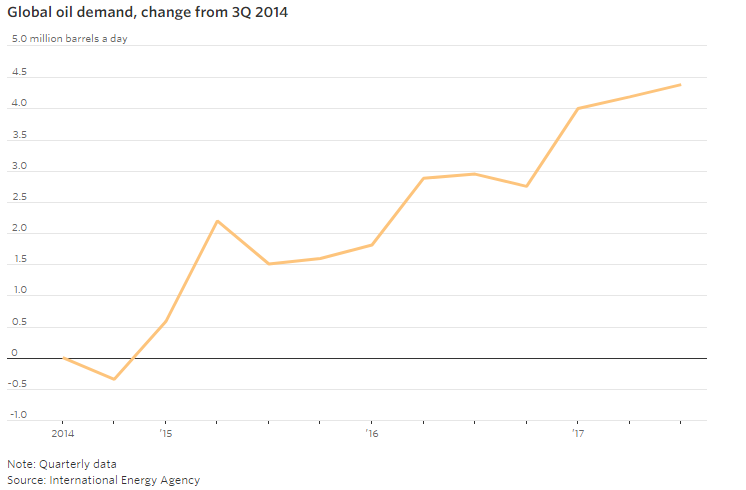 Global demand for crude oil is still on the rise as the developing nations of Asia require more fuel for their expanding economies. Growing populations and better overall standards of living mean the world is using almost 5 million barrels per day more now than just two years ago. Rising global demand is being met with shrinking stockpiles. The decline is small but surprisingly persistent. The Venezuelan oil industry is in freefall. 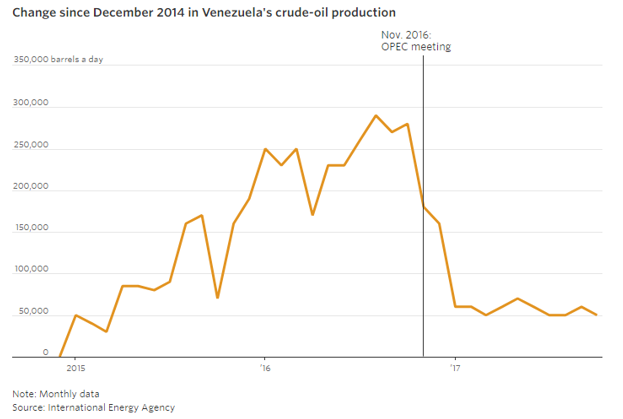 Once one of OPEC’s biggest swing producers and a key supplier to energy-hungry America, Venezuela is a mere shadow of its former self. Political strife and incompetent leadership have taken millions of barrels of Venezuelan crude off line. With seemly no end in sight to the tragedy in Caracas, Venezuelan oil could remain offline for a long time. Rising tensions in the Korea peninsula now include the real threat that North Korea possesses a launch vehicle capable of delivering a heavy nuclear payload to nearly everywhere in the continental United States. Recent analysis of Kim Jong Un’s latest missile test indicates the potential of a rocket capable of carrying multiple warheads and electronic countermeasures in a single launch. This would make it extremely difficult to defeat with even the most advanced missile defense system. This missile increases the potential for a shooting war between the US and North Korea which could quickly expand to oil-hungry China and beyond. The rancorous rivalry between Sunni Saudi Arabia and Shite Iran also has the potential of changing the global geopolitical landscape overnight. Since both countries are major powers in the Mideast, one wrong move by either side could have immediate and dramatic consequences for the price of oil. A resurgent Russia and newly emboldened China continue to flex their muscles. Russia continues its control of diplomacy in the Middle East as well as its cold war posturing with Europe and the United states. China is expanding via the militarization of the South China Sea in Asia and its rapidly expanding commercial ties with Africa. Meanwhile the US State department is busily being dismantled by Secretary Rex Tillerson. Diplomats with years of experience are leaving or being forced out and there are no replacements waiting in the wings to replace them. This means the US will be less able to respond to a major global crisis with diplomacy, making it more likely that it will respond militarily. Any major military escalation in the Mideast or Asia could light a hot fire under crude oil prices. In fact, very little of today’s geopolitical uncertainty is priced into crude oil right now. In fact, two years of sideways market action have made option seller somewhat complacent. This has resulted in relatively inexpensive call options and set up the potential for a longer-term “big move” trade in oil. Our upside target for crude oil over the next 12 months is $70, which represents a rally roughly $12.50 per barrel from current levels. RMB Group trading customers may want to consider buying December 2018 $65 crude oil calls while simultaneously selling an equal number of December 2018 $70 crude oil calls for a total cost and risk of $750 plus transaction costs. This “bull call spread” closed yesterday at $590, a full $160 point below our recommended entry level. This trade has the potential to be worth as much as $5,000 should crude oil rally to our $70 per barrel objective prior to option expiration on November 14, 2018, giving it 50 weeks – or nearly a full year – to work. Check with your personal RMB Group broker if you do not understand the trade and/or are interested in taking a bullish position in crude oil. He or she can help you design a strategy to fit both your budget and risk tolerance. Please be advised that you need a futures account to trade the recommendation in this report. 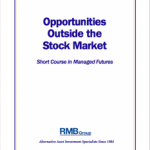 The RMB Group has been helping clients trade futures and options since 1984 and are very familiar with all kinds of option strategies. Call us toll-free at 800-345-7026 or 312-373-4970 direct to learn more about this trade. This material has been prepared by a sales or trading employee or agent of R.J. O’Brien and is, or is in the nature of, a solicitation. This material is not a research report prepared by R.J. O’Brien’s Research Department. By accepting this communication, you agree that you are an experienced user of the futures markets, capable of making independent trading decisions, and agree that you are not, and will not, rely solely on this communication in making trading decisions. The risk of loss in trading futures and/or options is substantial and each investor and/or trader must consider whether this is a suitable investment. Past performance, whether actual or indicated by simulated historical tests of strategies, is not indicative of future results. Trading advice is based on information taken from trades and statistical services and other sources that R.J. O’Brien believes are reliable. We do not guarantee that such information is accurate or complete and it should not be relied upon as such. Trading advice reflects our good faith judgment at a specific time and is subject to change without notice. There is no guarantee that the advice we give will result in profitable trades.